Freezing temperatures are almost inevitable during the winter months in Western Kentucky and Northwest Tennessee. It’s extremely important for your irrigation system to be winterized to prevent costly damage that can be caused by freezing temperatures. We recommend that you schedule your Winterization Service in October or early November. When our technicians perform your Winterization Service, they will remove any water from your system to prevent your pipes from freezing. They will also turn off your system, if it is still on. Our trained technicians have the appropriate equipment and expertise to remove all water from your water lines and backflow, to reduce the likelihood of damage to your system during the winter. If a hard frost is predicted, before your Winterization Service has been performed, be sure to run your system for a full cycle the night of the frost. 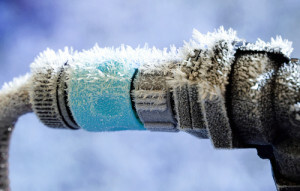 Running water through your irrigation system during the coldest part of the night will help prevent your pipes from bursting.